Nothing could warm the cockles of one’s heart more on such miserable wet winter evenings as Ireland is presently enduring than the utterly delightful theatrical jewel ‘The Far Off Hills’ directed by Mikel Murfi. lley, Julie Sharkey and Niamh McGrath. It runs at the Pavilion Theatre in the seaside town of Dún Laoghaire from December 16 to 18 and from December 19 to 20 at the Ramor Theatre in Virginia, county Cavan. Displaying immense resourcefulness, the cast all play multiple roles, some both male and female and often with split-second changes from one character to the other with accompanying changes in gestures, body posture, voice and facial expressions. So adroit were the performances that even though stage props were minimal – basically, a big blanket across the center of the stage – the play oozed verisimilitude. 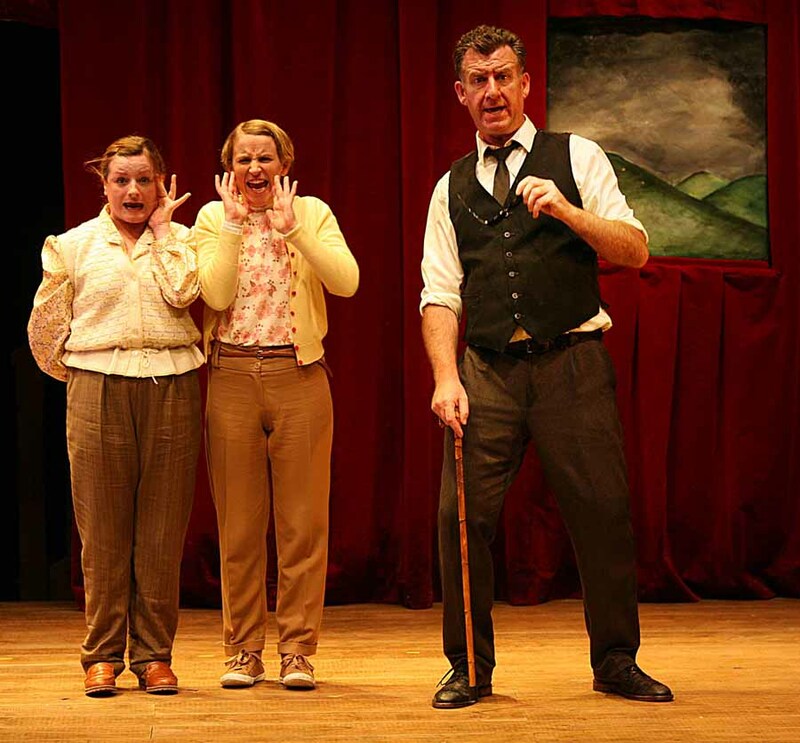 Set in rural Ireland, ‘The Far Off Hills,’ Robinson’s first three-act comedy about Irish life, is a light-hearted portrayal of the marriage game and its ramifications for a simple household in which the artful scheming of two mischievous daughters plays a pivotal part. Marian, the starchy oldest sister, rules the household with a firm hand, much to the dismay of Patrick, her father, and her more fun-loving younger sisters Pet and Ducky. But that situation changes – to the benefit of all. In such a fast-paced production where timing is crucial, it is a difficult task to separate each actor on merit. Suffice to say, as an ensemble, they seemed to be having a thoroughly jolly time on stage, displaying an infectious enthusiasm that filtered its way down to the audience with spontaneous applause erupting throughout the show. Steve Blount faces a triple impersonation challenge and carries it off wonderfully – playing near-blind Patrick, a father in bad need of cataract surgery, as well as depressed, deadpan lonesome local farmer, Harold Mahony, and the debonair and devilishly handsome blow-in, Pierce Hegarty. 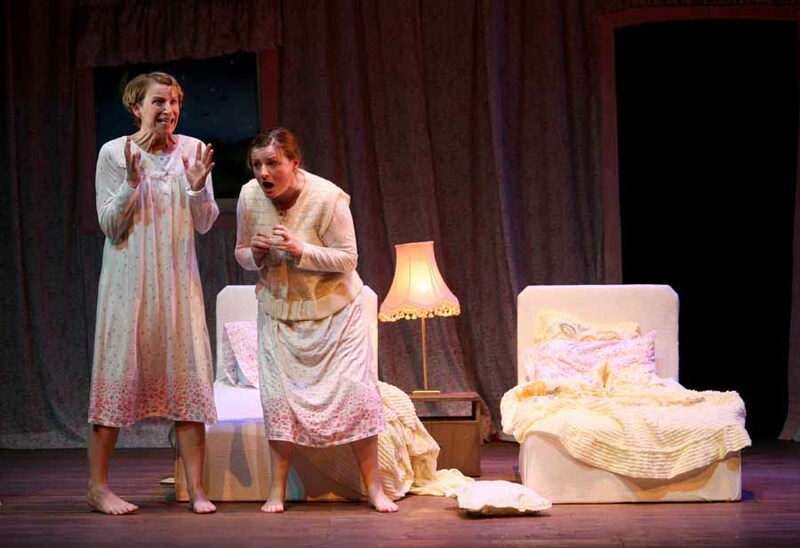 Julie Sharkey and Niamh McGrath also face a tough task, each acting out very contrasting roles – giggly, sassy adolescent daughters scheming to get rid of their domineering, prudish older sister, and two garrulous cronies of Patrick’s keen on sharing with him gory details of the latest sensational murder. What was also admirable about the cast was the easy, relaxed rapport they struck up with the audience. Right from the start, most unusual in theatre, Blount introduced each actor who stopped fussing with props on stage and said a few words about who they were. 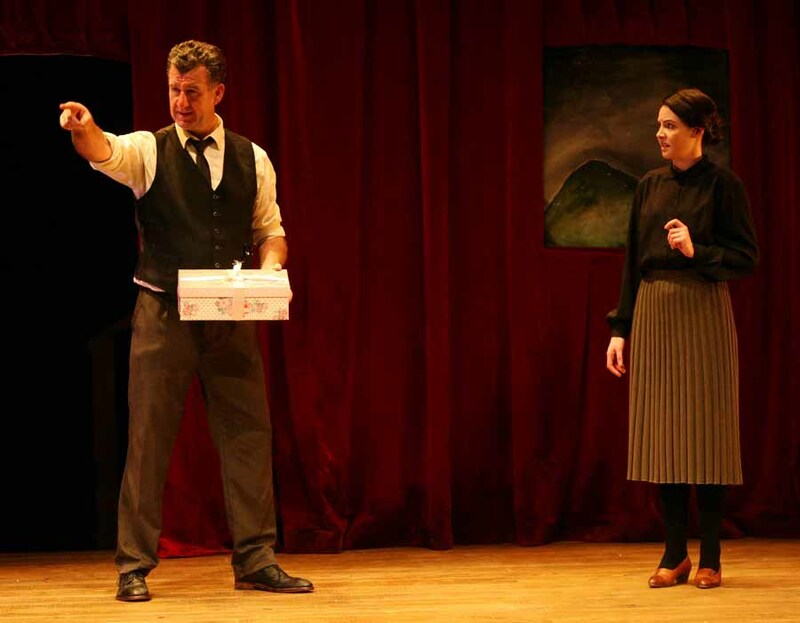 Even during the play itself, the actors confidently interacted spontaneously with the audience when the opportunity presented itself, as when a gift box containing a dress for Marian from Pierce slid accidently off the stage and when an audience member sneezed. The set, while simple in nature, helped create a two-dimensional effect, with cast members behind and to the side of the ‘blanket,’ which acted as a wall, carrying out peripheral activities as the main action continued stage center. 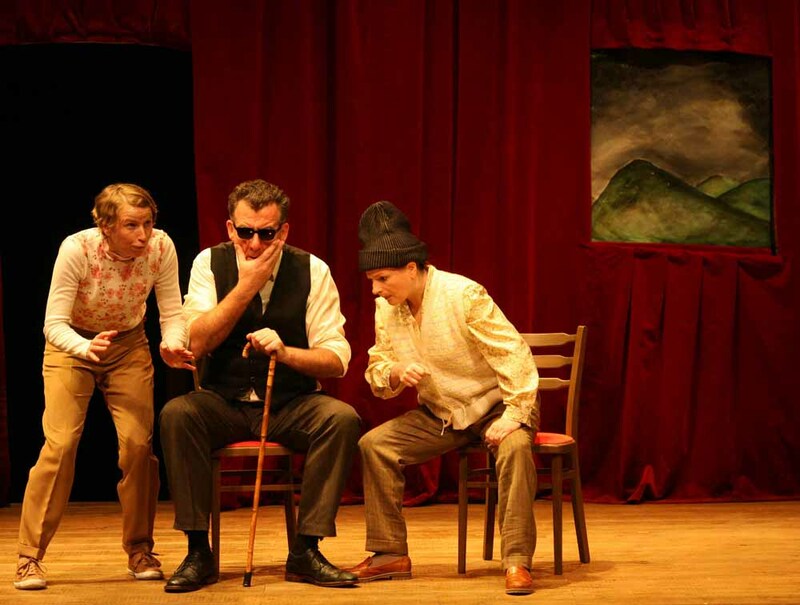 ‘The Far Off Hills’ is produced by Loco and Reckless Productions in association with Nomad Theatre Network. Set and costume design is by Sabine Dargent and lighting design by Nick McCall. Posted in Arts & EntertainmentTagged acting, An Grianan Theater, Brian Farrell, Cavan, Donegal, Ireland, Julie Sharkey, Lennox Robinson, Letterkenny, Loco and Reckless Productions, Mikel Murfi, Niamh McGrath, Nomad Theatre Network, Pavilion Theater, Ramor Theater, review, stage, Steve Blount, The Far off Hills, theaterBookmark the permalink.